Written by Jason Greenwood on 07 February 2010 . The Brigade Memorial Garden was one of the first memorials to be created after the National Memorial Arboretum was itself opened to the general public. The Garden was dedicated on 22nd June 2002 by the Rt. Reverend Paul Barber, Honorary Assistant Bishop in the Diocese of Bath and Wells (Bishop Barber is a Vice President of the Brigade Association). Also dedicated during the ceremony was the Lectern Bible which was donated by the Brigade Association for use in the Millennium Chapel in Advent 2001. It is estimated that around 50,000 Brigade Lads served in the First World War during which, many honours and distinctions were awarded including 21 Victoria Crosses. The Brigade contributed two Service Battalions of the King's Royal Rifle Corps whose members were comprised entirely of past and present members of the Church Lads' Brigade. These were known as Pals Battalions. Sadly, many of these young men were never to return home. It is not recorded how many Brigade personnel served in the Second World War, nor the honours awarded, but we are aware that an additional Brigade lad received the VC in 1945 posthumously. Younger Brigade lads also served on the Home Front in both world wars. They worked closely with the Civil Defence organisation and the Fire Brigades while others would support the local authorities by providing bands for moral lifting civic events. The Girls' side of the movement was also occupied on the Home Front in both world wars, particularly with First Aid, carrying messages and even guiding soldiers through the capital to various railway stations. More information can be found out about the Brigade's history here. The Brigade is undoubtedly a movement of the twentieth century. Many people have dedicated the whole of their lives to serving the work of the Brigade mainly in times of peace. The Brigade Memorial Garden is also dedicated to such people. It truly is a place to celebrate "the joy of knowing someone special." The Twenty Two Berberis Shrubs - These have been selected to represent the Brigade's military past but more specifically, to represent our 22 Victoria Cross recipients. This is because they are purple and similar in colour to the medal ribbons awarded to most VC recipients. i.e. The colour of valour. The Pathways form a Christian Cross - This represents the Brigade's present path through life. In a sense we all have to walk The Cross. The Two Rowan Trees - These represent the Brigade's future because, as they grow, they will always be greater than the past. The garden originally had two rustic benches donated by the London Branch of the Brigade Association but after six years of valuable service these were replaced in 2008 by more modern benches with cast iron end frames complete with the Brigade logo on the end of each bench. The end frames are also painted green to commemorate the uniform worn by the King's Royal Rifle Corps. It should be noted that the berberis plants are of a variety that will not grow higher than 18 inches. This is to ensure that people sitting on the benches have an unrestricted view over the plants to the rest of the Arboretum. 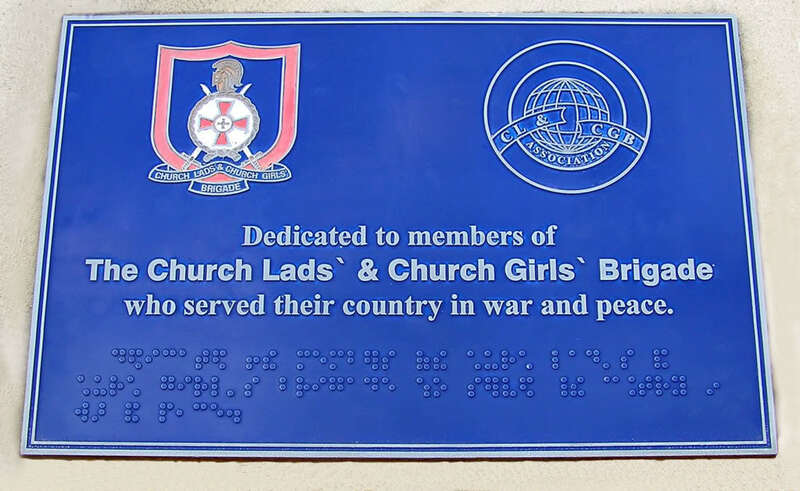 Although the Brigade is a Church of England organisation its Memorial Garden is intended to be a place where people of other Christian denominations and other faiths will feel comfortable and welcome. We feel honoured to have been allocated such a wonderful location, which we see as an extension to the Chapel, effectively its churchyard, where people can sit to relax and contemplate in the normally peaceful surroundings. The Brigade is grateful to its many sponsors without whom the Brigade Memorial Garden would never have been created. 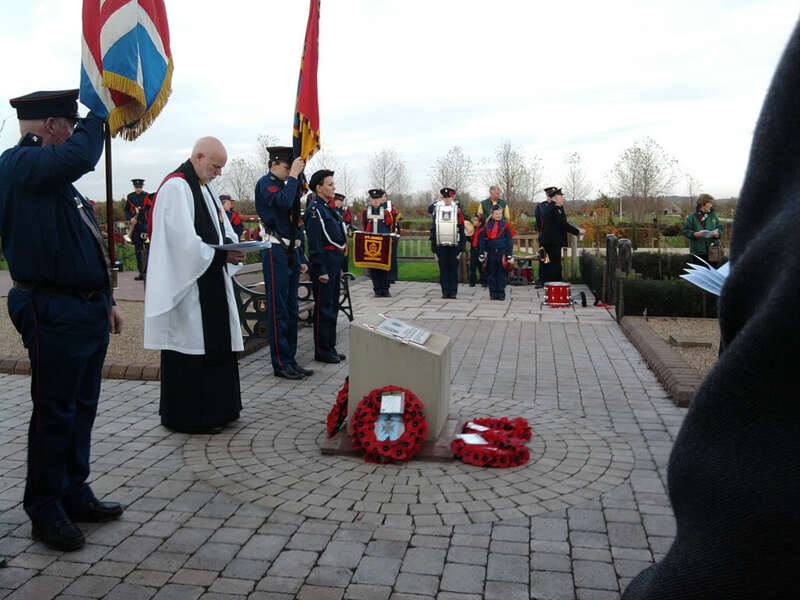 In recent years, the Brigade has held its own annual Service of Remembrance in the Millennium Chapel and in the Brigade Memorial Garden where wreaths are laid to honour the fallen. Those members of the Brigade family who have passed away in the preceding twelve months are also remembered by the reading of names being added to the Roll of Remembrance. This service takes place on the nearest Saturday to 11th November, which is the anniversary of the opening of the first Brigade Company at St Andrew's Fulham in 1891.